That Floyd link is a Syd show from 1970, not the Floyd show from ’67! I remember this concert well having been to the 14 Technicolour Dream earlier in the year and then a regular at UFOs in Tottenham Court Road on Friday nights. 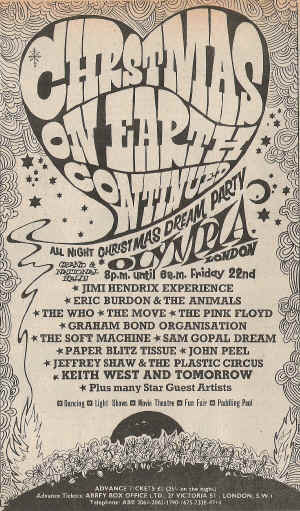 London in 1967 was a special place with great music and small clubs all over the place. Free concerts in Hyde Park rounded it all out. Also not known widely but Brian May from Queen was in his schoolboy band, 1984 (with Tim Staffell) and they played this gig too.. Tim and Brian went on to form Smile with Roger Taylor. Then Time left and suggested his roommate Freddie join up with Brian and Roger…. I was there. 17 yrs old. An American student in London with no idea what i was about to see. We spent our weekends at the marquee club and hyde park. An extension of the Hippie psychedelic experience complete with visual gel screens strobes in a cavern of a venue. Eric Burden was a big draw, Hendrix Floyd…what a show! the last gasp from the scene. Thanks for reminding me. I was there, just back from the front when Jimi came on. All the lights went out, Jimi smashed s lighted cigarette against the mic stand and away they went. I swear I got Hendrix spit on my parka. I remember the magical blues on the Flying V and Spanish Castle Magic. I also remember tension between Jimi and Noel. At one point Jimi was tuning and glared and barked at Noel ‘Give me an F’. Magical night. I was there, and in fact, the ‘Marmalade Skies’ quote is actually a lifted quote from my pieces on the Pink Floyd website ‘A Fleeting Glimpse’. Not often mentioned was the no-show of The Move, who were originally going to play. But Hendrix was ace, and yes, openly angry with Redding during the performance; Traffic were brilliant, Soft Machine were fantastic, and Eric Burdon was good. Floyd were good as well, even with a non-functioning Syd. His guitar wasn’t plugged in as I recall. Not as good as the Ally Pally in the summer, but a great all nighter all the same. And yes, the end of a short but beautiful period for psychedelia. …or also, the Who, who didn’t show either – Moon had been injured. And a mention for Tomorrow, the great unsung band of the flower power period. You must have been on something,the Move Did play,just before Hendrix on the stage opposite,in fact l think they might of stood in for the Who! They had an effigy of the then prime minister Harold Wilson on stage,which they stripped throughout their gig ending up giving it a good going over! What a night..sorry about Syd…the rest of the band did us justice, and have done ever since! The no-show was by The Who. There were a few rumors circulating as too why, but not worth repeating as it was so long ago. The Move were there and already scheduled to appear, so they weren’t acting as a stand-in act. An altogether never to be forgotten and amazing all nighter. Happy days. I was there with Georgie my muse at the time . Sadly she overdid it on snowballs by the time Hendrix came on and so she was fast asleep! Saw Sam Gopal many years later. Place seemed half empty? I was there with a friend. I was just 17. The set up was unusual with two stages at opposite sides of the huge Olympia hall and no seats only plywood platforms with sloping edges to lean against or lie on. We noticed Hendrix setting up on the opposite stage and went and stood right next to it. The stage was not high and I reached out and touched his foot. Then he adjusted his amp and asked us if that was OK. I mean we were fans chatting to Hendrix as he set up! He played with just his feet fingers, teeth and behind his head and he was amazing. The other highlight besides Eric Burdon was Traffic, we were told their first ever gig. They were truly amazing. And, no one mentions, the band currently enjoying a hit then with Teenage Opera song about Grocer Jack . For us the other memorable moment was when Pink Floyd came on early in the morning, maybe the last band (it did go on all night) and we were lying on those platforms and this amazing sound and light started escalating. We thought it was great. Sorry it’s written up as a terrible performance, to some of us it was pure magic. You really did have to be there and if you were you won’t forget it. And yes I too created my own light show after that: coloured food dye neutered sheets of slide glass in a slide projector and a strobe light with a mechanically driven aluminium plate with a hole. I was there, noticed Noel Redding and Mitch Mitchell setting up half way along whilst another band was, I thought playing at the far end. So I positioned myself right in front of the very low stage, I was probably next to you! I had long blond hair and a beard which I’d managed to keep during months locked up in the Middle East. Got back in March that year to arrive half-way through a friend’s down my street two week party – and then the Summer of Love, Wow! What a time to be young, we were so lucky. 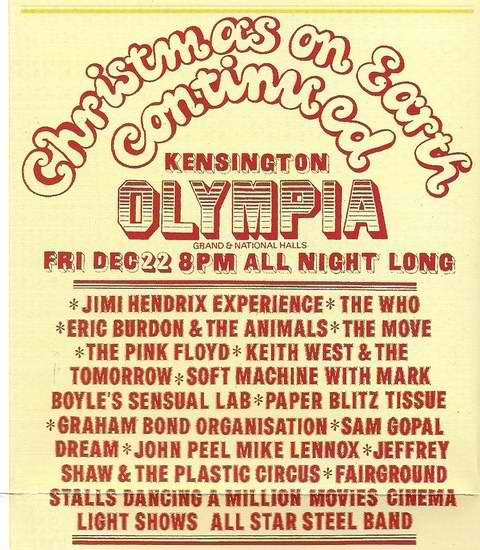 I was there and Hendrix is the only performance I can remember. Will never forget that.